We have seen in our date object example how to display current date and time where the current date and time is displayed once. Here we will try to display changing clock or real time change in date and time by using setTimeout function. This setTimeout function we have used to trigger the time display function in a refresh rate of 1000 mill seconds ( 1 Sec ). This refresh rate can be changed to any other value. By changing the value to 5000 the clock will refresh and show the exact time once in every 5 seconds. Here is the demo of this script and code is given below that. To change the display format we need to change the function part only where we can change the display part. We can display 5 hours as 05 hours or 2 minutes as 02 minutes. 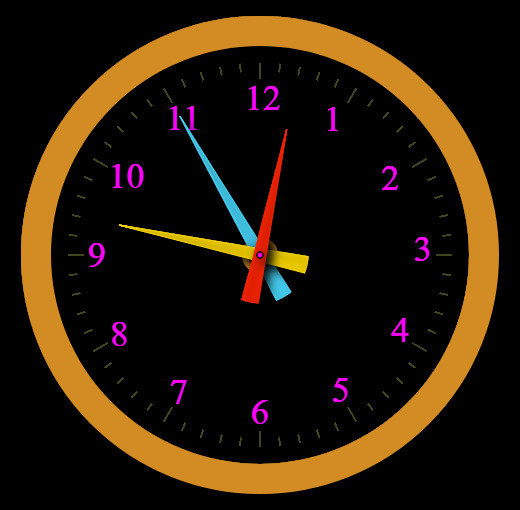 Read how we can toggle the display of the clock by controlling from a button. Hi! I would like to ask if how can I display the time in textbox? Thanks. Great tutorial. Do you know if it would be possible to display the servers time instead of the clients? You need to use and server side script like PHP, ASP etc to display server time. Here is an example of displaying server time using PHP. wow..it is really helpful. But i want same thing in date picker control. Is it possible ? i want to change the text font size and font name....How? By using style property we can manage font size and font color. Demo added. How to change time-zone in example UTC string? wow! my year displaying as 114 instead of 2014 had been bugging me a long time, went looking today and found this page, thank you! Happy to find this blog.. I want to start with server time, which works for the rendering time of page. But then stops. How to increment? To get updated server time , you need to refresh the page at a interval. Another way is to use Ajax which gets the time from the server without refreshing the page. This code initiates 'new Date()' with server date. I expect your code to increment as it does, when 'new Date()' is initiated with local time. Why that does not work? i saw your stop watch script how i can run the clock without clicking button, and i want to show the same time even after refresh the page. How i can do. To get the server time and increment it we have to use Ajax. It connects to server in every one second and gets the data. You can read the tutorial and download the script here. Thanks so much, I have enjoyed learning through this tutorials. You should consider altering the code for any time that has a minute or second that is less than 10. Your way shows the time as being "9:2:3" instead of "9:02:03"
It works and very useful.. Thank you..
can you display CST and UTC at the same time? I tried pasting both scripts on the same page but only one will run. Hi, I want to check how can we add time for Different countries like, IST EST , South Africa or Dubai in a continuous clock program. One more page added showing time in different cities of different time zone. For comparison , local time and GMT time is also shown. Let us know how they are working. More cities will be added to this. Link is at end of the article. Can I also Display a Real time changing Clock of an internal time Server in a HTML Website? What is the declared variable "strcount" for? And why have the return value of "tt" for the "display_c()" function call? Both are not required so removed .